The effect of this dehumidifier is related to the temperature,the humidity and the size of the room. The more humid,the better effect.The smaller the room,the better effect. ★【High-efficiency ABS Plastic/ROHS Water Tank Small Dehumidifier for basements】Small dehumidifier but big power for dehumidifying the moisture: ★★Larger air inlet design makes it 360-degree remove the moisture upmost to 300ml water per day at 30℃ and 80%RH condition, quickly clears up the dampness, keep your clothing, bedding, walls and wooden furniture dry; and prevents some respiratory diseases and allergy triggers. 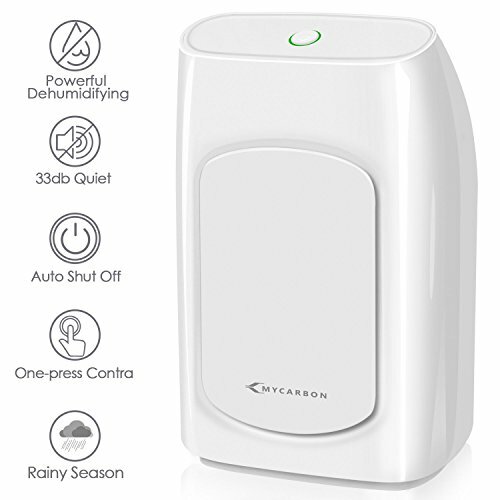 ★【Ultra-Quiet Sleek Home Safe Dehumidifier for bedroom】MYCARBON mini dehumidifier is made of Advanced Peltier Whisper Technology ( no compressor and moving parts) with 35db lower noise no annoying sound, and filter the dust mites, mildew, mold and wet fishy smell in the air to make a better environment for your sleep, work or study. Sleek and unique design can decorate your room. ★【Auto Shut Off & Radiation-free & Super Safe Dehumidifier】MYCARBON dehumidifier will shut off automatically when the tank is full of water,and the indicator will turns to ORANGE when it reached maximum capacity 700ml, super safe to dehumidify the moisture when you are sleeping or out of home. Radiation-free, you can use in baby room. ★【One-touch Compact Small Dehumidifier】Measure 5.87*3.85*9.61 inches and weigh 0.96kg. One-touch operation, very easy to use and get up compact portable lightweight dehumidifier, suitable for small places up to 160-215 sq.ft, ideal for removing moisture in the Kitchen, Bedroom, Bathroom, Closet, safe, Wardrobe Room, Storage Room, Study Room, office,Caravan, Camper, Garage, Motorhome or RV. ★【Energy saving and environmental protection】High quality condenser thickened radiator, it's condensin is twice as fast as other dehumidifiers on the market, dehumidify the humity more thoroughly but low power per day. ★★24-month Free Returns & Exchanges and best service for our customers★★ please feel free to order MYCARBON Mini Dehumidifier for home. ★Please Note: For less humid areas(RH<60%) or the temperature is below 15℃, it may take several days to fill up the tank.